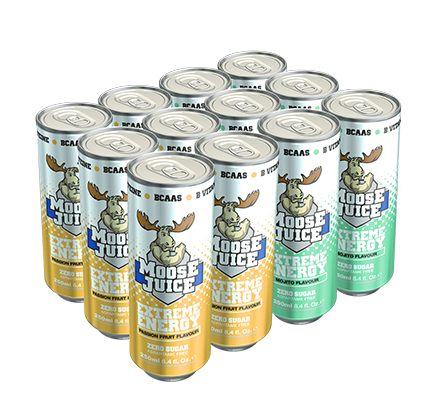 View cart “Moose Juice Mixed Case – Berry, Blue Raspberry, Green Apple” has been added to your cart. Can’t decide which flavour? Mix it up and have BOTH Passion Fruit AND Mojito Moose Juice! Moose Juice is a seriously strong, zero sugar energy drink that’s loaded with BCAA’s – perfect whenever you need a moosive boost with no crash. Your favourite zero sugar energy drink in a pick ‘n’ mix case! Moose Juice Extreme Energy is a sparkling energy drink with added BCAAs and B-Vitamins. Low calorie, zero fat and zero sugar – Moose Juice is your new best friend for an energy boost without the crash. Whenever you need an energy pick-me-up, just get a boost from the Moose!